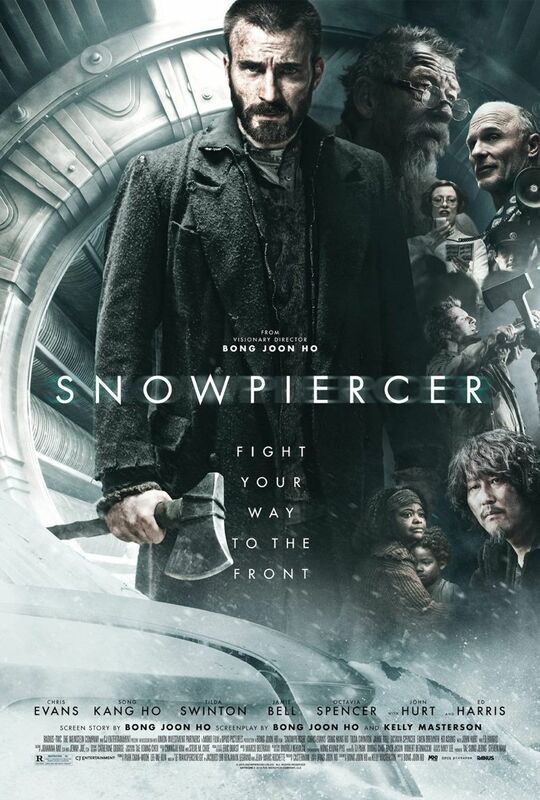 “Snowpiercer.” Yeah, I didn’t know what it meant either until I saw the movie. Now, I want one. In the year of our lord, 2014 (hey, that’s now), the world scientists decide to seed the sky with a special chemical to combat global warming. It works so well the entire planet undergoes a deep freeze that kills every living thing… except those who boarded the Snowpiercer. Built by the visionary Wilford (Ed Harris from “Gravity“), the Snowpiercer is a train with an eternal engine that circles the globe. It’s a self-supporting eco-system and the only thing keeping mankind alive. As long as the engine keeps running, people will live. Well, some people will live, like the people at the front of the train. This “rattling ark” where people give their right arm for their children is not a paradise. The people at the back of the train have suffered for 17 years under the dictatorship of Wilford and the rules imposed by those at the front of the train. The people at the rear of the train have been planning a revolution. It’s been tried before, but this time they are led by Curtis (Chris Evans from “Captain America“), who will not sit quietly and will not accept his station in life. Under the tutelage of Gilliam (John Hurt from “Only Lovers Left Alive“), Curtis feels destined to make it all the way to the front of the train. Once there, he plans to kill Wilford and take over the engine. This movie had the claustrophobic feel of “Gravity,” along with the sense that death is just outside a thin steel wall. A world unto itself inside a box in constant motion. There are religious overtones spread between the layers of social commentary, but the theme of the movie seems to be humanity. It begins with the class system, then sacrifice, and the order of civilization where the leader becomes the Lord. In the end, it’s about free will and survival of the species, and for some, how liberty trumps security. Okay, the movie got to me. I wanted to laugh and point out the logical absurdities, but it got to me. Using this incredible engine for a train is silly, unless you see it as a metaphor for life and time. We are all on this train, and we feel we must keep going to survive. If we get off or do anything different than anyone else we will surely die. We see the operator of the train as a god, or the government, and we blame them for our place in life and feel powerless. The dream that we can destroy our oppressor and right the world is noble and naive at the same time. We are our brother’s keeper, and our brother wants to be free.